No three letters in the alphabet bring about such fear and anxiety as I-R-S. Add to that a particularly confusing item for homeowners, Form 1098, and, you may as well just go now and pick up that 5000-count bottle of aspirin from Costco. Thankfully, there is another combination of three letters that can make things a whole lot better: T-M-S. We’re here to help you Grow Happiness in any way we can, and demystifying and making Form 1098 understandable is just one of the ways we do that. Especially considering the tax changes that will take place in 2019. So, the aspirin run? Forget about it. Tax Deductions are a Good Thing! First of all, let’s lay the groundwork. Having a mortgage allows you to do something very special—it allows you to take a tax deduction or two…or three, or more. That’s a good thing, because it means you get to reduce the amount of your total income; therefore, reducing the total amount of income you’re taxed on. Renters don’t get it; 40-year old’s who live with their parents don’t get it; pets don’t get it–homeowners get it, so count yourself among the special. For homeowners, there are two ways to reduce your income through deductions. You can either itemize deductions, or you can take a preset standard deduction. You have to pick one, and the one you want to pick is the one that gives you the biggest deduction. Itemized deductions are a combination of several different allowable deductions for payouts you’ve made throughout the year, like charitable contributions; property, state, and local income taxes; and mortgage interest. A standard deduction is a flat figure deduction that is determined by the IRS and is based on your filing status. So, for example, married homeowners filing jointly get $12,700 as a standard deduction, single homeowners get $6,350, and the list goes on. At least that’s how it worked for the 2017 tax year. 2018 brings about a big increase in the standard deduction figures, which means you’ll have to have a lot of itemized deductions in order to have a figure that outweighs taking a standard deduction. And if it means just taking a standard deduction, it means simplification. And again, less aspirin involved. But we’ll get to all that later. So, let’s get to it. Form 1098 is the form used to record one of the big itemized deductions you have: the mortgage interest you’ve paid out over the past year. When you make a mortgage payment, there are two figures that are added together to make up your monthly payment: the principal, and the interest. The principal is related to the figure you asked for from the lender when you originally obtained your loan, and the interest is what the lender charges you to borrow it. The part you’re interested in is the interest portion of that monthly payment–that’s what you might be able to use as part of your overall deductions. So if you take the interest you’re charged from January through December and add it up, that gives you the total mortgage interest you can deduct for the year. But you don’t have to worry about calculating this. Your lender files this figure on Form 1098 with the IRS and also provides you with a copy, either through the mail or electronically after the first of the year. Below is a sample of what a 1098 Mortgage Interest Statement looks like for the principle residence of fictional homeowner, Larry. See the $12,333.11 in Box #1? That’s the total mortgage interest Larry paid last year. That’s the total he may be able to use for his mortgage interest deduction. The figure in Box 1 on a 1098 is then added as a deduction to Line 10 on Larry’s 1040 Schedule A form (below). 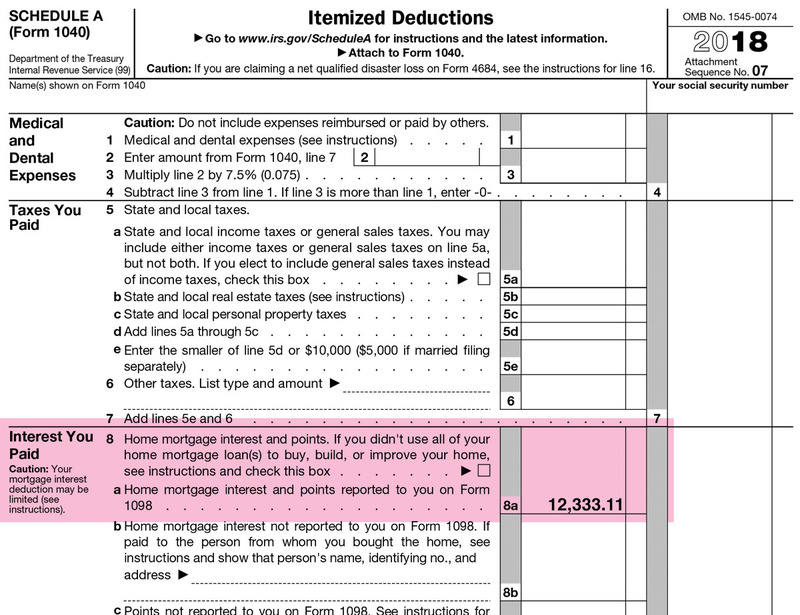 This is included with Larry’s other deductions and all are added up to arrive at a total, Line 29, that gets subtracted from his total income. The more deductions he has, the more his income is reduced, the less he’s taxed. That makes Larry feel all warm and fuzzy inside. Then what Larry would do is compare Line 29 with what his standard deduction is. Whichever figure is bigger, that would determine if Larry should go with the itemized deductions or the standard deduction. This will definitely come into play for Larry and you in 2019. Like we said earlier, the standard deduction one can take is going to be much bigger for 2018. This is the result of Congress passing the Tax Cuts and Jobs Act of 2017. If you look at the chart below, you’ll see how your standard deduction increases this year over the previous year. Seniors can add even more to these standard deductions. If you’re a homeowner age 65 or older, or blind, you can add $1,600 if you’re single, or $1,300 if you’re married. The other big thing associated with the legislation are changes to what you’re allowed to itemize. Those state and local taxes you were allowed to deduct the full amount for last year? Now you can claim no more than $10,000. For higher income taxpayers this isn’t exactly good news. What about changes to the interest you can deduct on mortgage-related loans? Well, it used to be you could deduct interest on mortgages of up to $1 million–now it’s $750k+. Obviously, that cut does not affect the majority of homeowners. But what may affect many is the elimination of deducting the mortgage interest on a home equity loan. So if you’re accustomed to deducting the interest on the home equity loan for that pool or finished basement you’ve added, that one is gone. What this all means is that more and more homeowners are probably going to be going the standard deduction route, and they won’t have to itemize anymore. Which makes things a lot simpler, right? But that doesn’t mean you should now dismiss Form 1098. You should still be doing your due diligence and figuring out what your itemized deductions for the year are versus the standard deduction. Everyone’s situation is different and itemizing might still work in your favor. The bottom line is to first educate yourself on what’s going on, like you’re doing now. Arming yourself with information, and understanding the big picture, helps lead you to the best decision. And TMS thinks that’s all about helping you Grow Happiness. Disclaimer: This article is provided by TMS’s Happy Hub for educational purposes only. It is not meant to constitute mortgage or financial advice, nor is it meant to constitute legal or tax advice. To make sure you are are making an informed decision, please consult one of our Loanologists (licensed mortgage loan originators) before proceeding with a refinance. By refinancing your existing loan, your total finance charge may be higher over the life of the loan.